Maybe it’s the occasional isolation and frequent darkness of a Northern Michigan winter that makes the idea of a dinner party so appealing round about February. 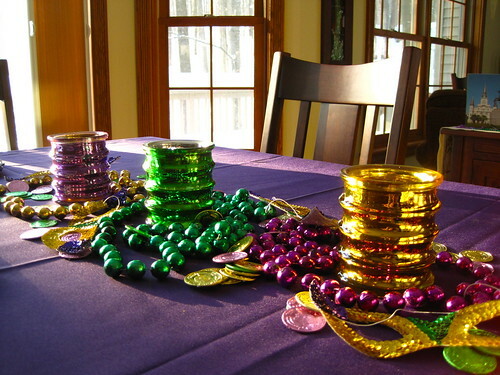 If so, it must have been on the evening of a new moon when James and I decided to have not only a dinner party but a full-blown Mardi Gras Party. 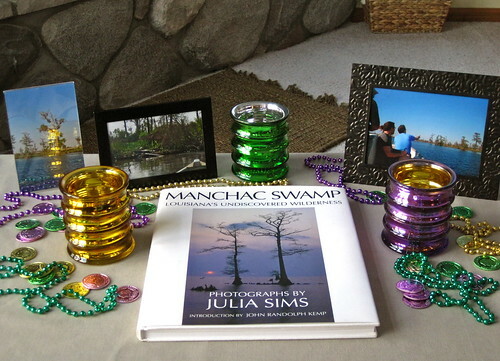 James flipped through our photo albums from trips to visit my family in Louisiana to create invitations, inviting all of our neighbors — some of whom we’d not yet had the opportunity to meet. 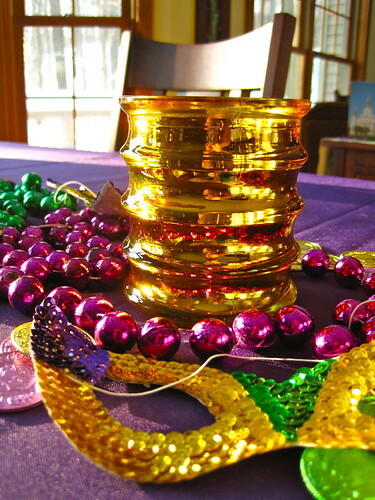 He also sought out endless bundles of purple, gold, and green beads, doubloons, masks, and other carnival finery. What was my job in all this? The food, of course! I went through my trusty recipe binders for some tried-and-true favorites. We also found some new gems online that only needed just a little spicing up. Before I knew it, we had quite the menu assembled. 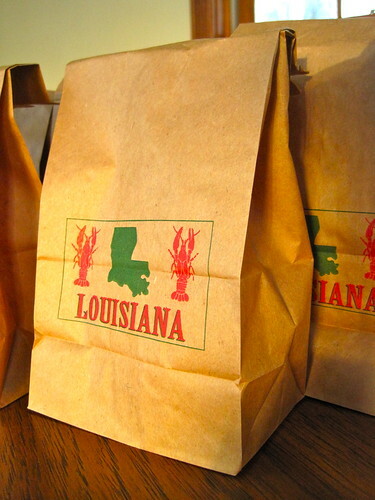 Spiciness is not a hallmark of Cajun or Creole cuisine — Regardless of what you may’ve heard, this is pure myth. Some people may be fond of dousing their plate with Tabasco or dusting everything with ground cayenne, but that’s all done according to individual tastes. Typically, dishes are served up with just a sneaky hint of spiciness and it’s left up to the recipient to season their portion to taste. Cast Iron Cookware — While not a requirement, good solid cast iron goes a long way in making the flavors, textures, and overall cooking experience come alive. Cast iron’s heat retention, resilience, and natural non-stick patina can make caramelizing, sautéing, and even simmering easier without any added chemicals or teflon coatings. If you don’t have cast iron, you’ll want to use a heavy-bottomed pot or skillet whenever cast iron is called for, otherwise the food may scorch or burn or you’ll possibly damage your cookware. Salt-Free Cajun Seasoning Blend — While you can readily find Cajun spice blends in the supermarket, these days, I find that most of them contain salt — and way too much of it. There are also some newer ones that contain a sort of salt substitute that tastes rather vile. So, if you prefer to purchase a ready-made spice blend, be sure it doesn’t contain salt if you’ll be using it in the recipes I’ve posted in this blog. The easier alternative is to mix up a batch at home where you can be in total control of the salt. You can find my recipe here. Andouille Sausage — This Cajun sausage has become so popular in recent years, you’re likely to find it either pre-packaged near the other sausages or in the meat case at your supermarket. 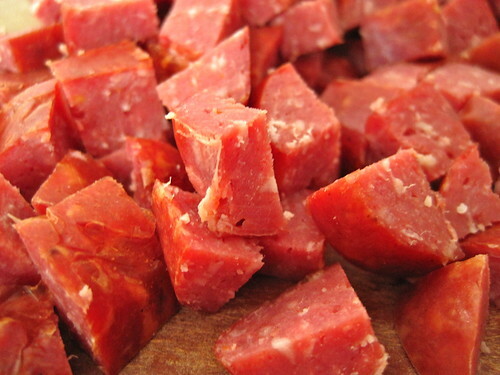 While I love the smokiness and spiciness of andouille, you can substitute a milder sausage if you wish. We’ve even had success using turkey kielbasa! Ham Bone — Don’t throw out that bone after your Christmas or Easter dinner! Instead, wrap it and put it in the freezer for later or toss it right into a pot to make the flavorful recipe I’ve posted below. If you don’t happen to have a ham bone, you can usually find smoked ham hocks in the meat section at your supermarket. If you really want to kick up the smoky flavor, you could use two hocks. 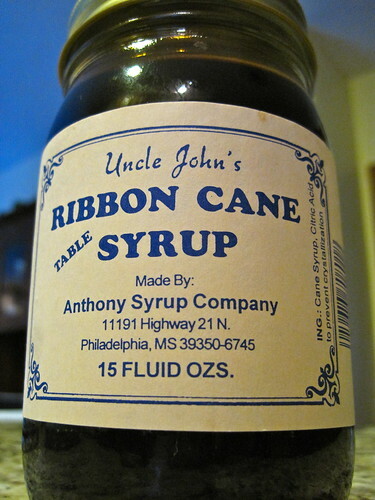 Cane Syrup — Before the advent of corn syrup and even before molasses there was cane syrup. It’s basically the dark and sweet juices from sugar cane cooked until they’re reduced to a thick and potent syrup that’s distinctively southern. While I don’t put it on my pancakes the way my paw paw often does, the taste is like molasses and yet noticeably rawer. Whenever we’re on a visit to Louisiana, I make sure I pick up a giant jar of cane syrup and a giant jar of unsulphured sorghum molasses. Cover a large work surface with a length of parchment paper. 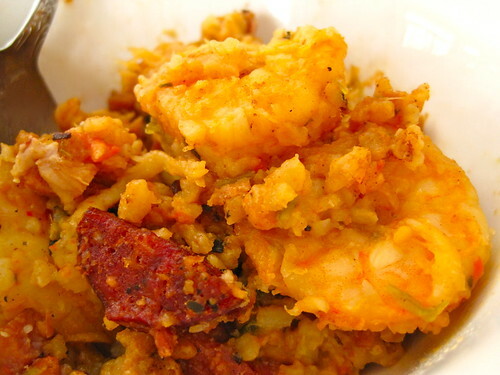 In a 10-12 inch heavy-bottomed or cast iron skillet, combine the maple syrup, five-spice powder, chipotle, and salt; stir until spices are incorporated into the syrup. Add the pecan halves; stir to coat. Turn the heat to medium-high and cook, stirring constantly with a wooden spoon, until all of the syrup has crystallized onto the pecans. 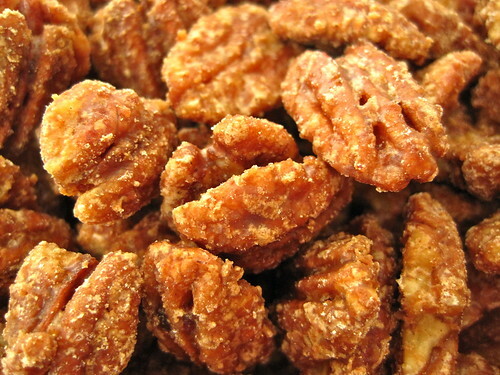 Remove skillet from heat and pour hot pecans immediately onto prepared work surface. Using the wooden spoon, separate the halves, as necessary, to prevent clumping. Allow to cool completely. Can be stored in an airtight container for 2-3 weeks. In the bowl of a food processor, combine the chopped celery, green onions, parsley, and garlic; pulse until finely chopped. Remove mixture and place in a small sieve to drain away any excess liquid. Cook chopped bacon in a Dutch oven until crisp; remove bacon with a slotted spoon. To the drippings, add the chopped onion, celery, bell pepper, and parsley; sauté for 3 minutes or until onions are translucent. 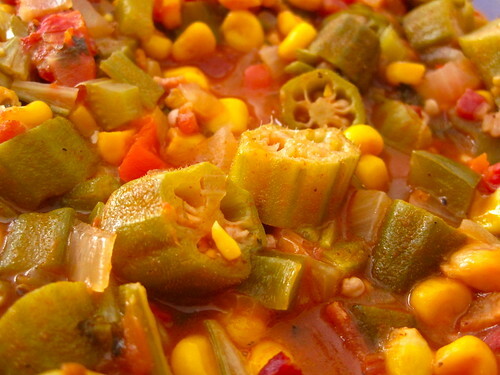 Add the remaining 5 ingredients (okra through salt) and cook over medium-high heat until vegetables have thawed and mixture is bubbling. 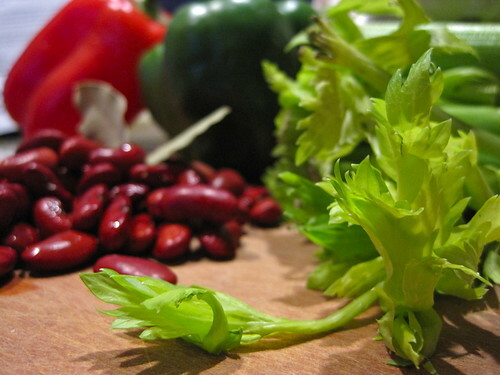 Cover, reduce heat to low, and simmer 15 minutes or until vegetables are tender. Stir in the crisped bacon. Serve over rice, if desired. Heat the olive oil in a large skillet over medium heat until shimmering; add the andouille and sauté until lightly brown, remove with a slotted spoon. To the drippings in the skillet add the onion, bell pepper, celery, and bay leaf; sauté 8 minutes or until vegetables are tender. 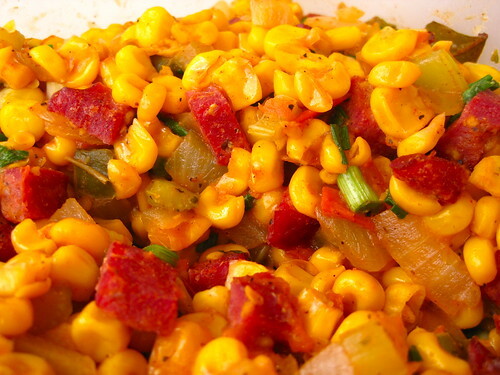 Stir in the corn, diced tomatoes, browned andouille, and Cajun seasoning blend; cook, stirring occasionally, 15 minutes or until tomatoes have broken down and most of the liquid has evaporated. Remove from heat, stir in the green onions, salt, and pepper. 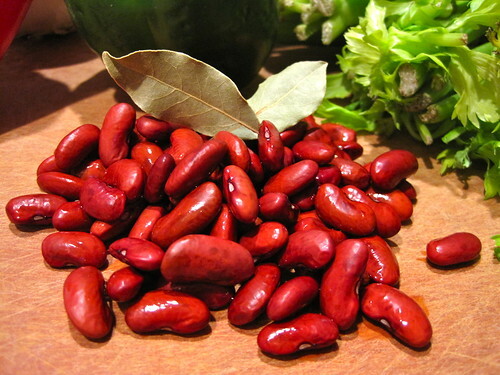 Soak beans in cold water overnight, if desired; drain and rinse. Heat the oil in a large Dutch oven over medium-high heat until shimmering. Add the red and green bell pepper, onion, and celery. Sauté, stirring occasionally, for 5-7 minutes or until onions are translucent and vegetables are soft. Add the garlic, Cajun seasoning blend, and bay leaves; stir constantly for 30 seconds or until fragrant. Add the ham bone, beans, and enough water to cover the beans (beans should be covered by about 1-2″ but the ham bone may not be fully covered). Bring to a rolling boil; stirring occasionally. Reduce heat to a moderate simmer and partially cover. Stir occasionally and check periodically to see if more water is necessary (you may need to add about a cup, gradually). When beans are tender, remove about 1 cup of them and a small bit of the cooking liquid and mash together in a small bowl until a paste is formed. Stir the paste back into the pot and add the chopped ham; add salt to taste (beans will likely be salted enough from the ham bone). Lower the heat to simmer and cover until ready to serve (remove ham bone and bay leaves before serving). Serve over rice and/or with a side of corn bread. 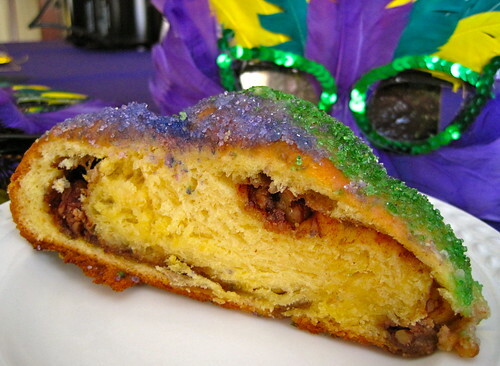 Refer to my recipe for King Cake for instructions on rolling out the dough for filling. Using your fingers, spread the softened butter in an even path down the center of the dough strip leaving a 2-inch border on all sides. In a small bowl, combine the cane syrup and vanilla; drizzle syrup mixture down the center of the butter path. In a small bowl, combine the sucanat, cinnamon, and salt; spinkle the sucanat mixture atop the butter and syrup mixture. Sprinkle the chopped pecans evenly over the strip. Fold one long side of the strip over the filling stopping just short of the end of the strip. Very carefully, pinch the long seam together to seal in the filling. On both ends, fold the dough carefully and pinch to seal. Bend the strip to form a large U-shape. Form a twist then form the twist into a large ring. Pinch the ends together carefully (do not let filling escape). Place the ring onto a parchment-covered baking sheet. Cover loosely with plastic wrap and then cover with a kitchen towel and place in a warm place to rise for 45 minutes or until doubled in size. Bake the cake as instructed in the King Cake recipe. Of course, for entertainment, we had a few special guests stop in: Dr. John, Irma Thomas, Fats Domino, Harry Connick Jr., Beau Soleil, and many others. They kept our feet tapping all evening while we chit-chatted and ate our fill, the perfect backdrop for such a Louisiana feast. The snow was over a foot high just outside the door, but you wouldn’t have known that with a bowl of gumbo in one hand and a hurricane in the other. So many flavors and friends gathered on one evening, winter briefly melted away, and we were all passengers in a street car passing beneath the leafy canopy of oaks in the Garden District. Hopefully all of our guests were as transported as we were. ~ by Jason on February 11, 2013. Everything was FABULOUS! 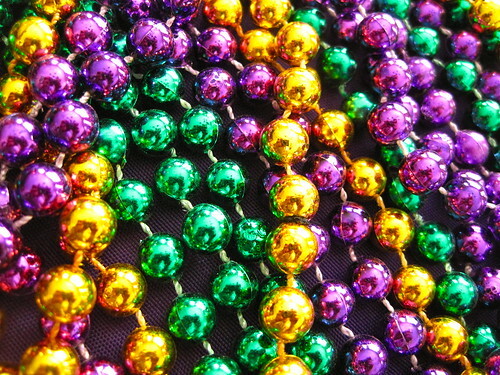 If I could say it in Cajun I would…. Oh Baby! We let the good times roll! Oo-la-la! The photos are just beautiful… between the two of you guys, you do everything perfect! hugs! Thanks, Teddy. We were so happy that everyone was able to come. If you thought everything was perfect, I’m definitely flattered… but, of course, you had no idea what was going on around 3pm on the day of the party! 😀 Madness! My eyes were the size of dinner plates! We wish we could have joined you! 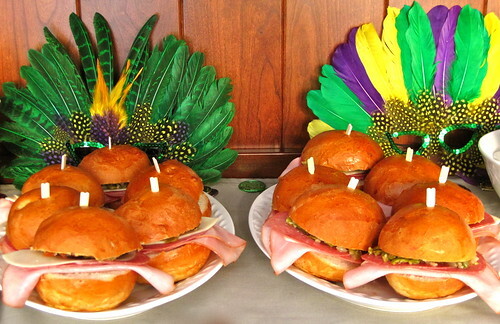 Our party was much simpler with the food…jambalaya, olive salad on baguette, king cakes, and hurricanes. Of course we were also trying to do this with a toddler and a baby and without you too! We were clearly at a disadvantage! We miss you and love you! You have no idea how much we missed sharing this particular party with you all. 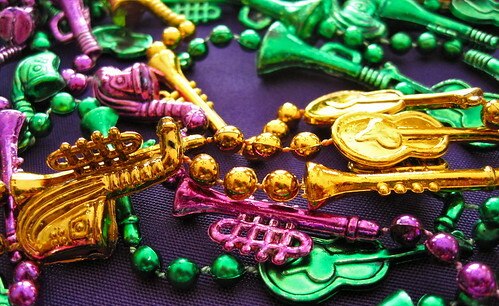 Not only are you a fellow Louisianian and a great cook, but we missed hanging out with you with all the Mardi Gras hoopla in the atmosphere. Miss ‘n love you too! Ha! Who, me? Blog?! I cannot seem to find the time. Much less the motivation. I really need to though. I realized just this week that Z is six months old, and I have barely blogged about him at all. Oh that looks so yummy! 🙂 And it really was pretty! Hope you didn’t have any pictures of me out while those neighbors were there! Love and miss y’all ! Love ‘n miss you too, mom! I miss home when you post stuff like that…it sounds awesome. It’s great to know that your cooking can be enjoyed no matter where you live. 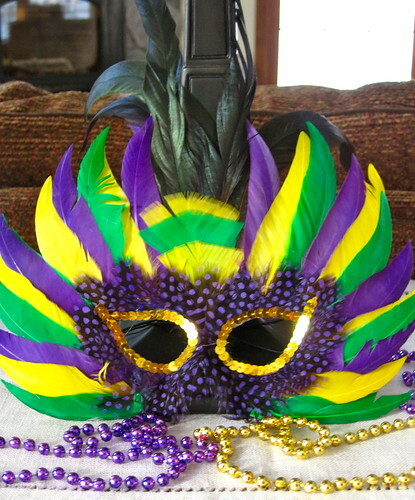 Louisianians just adapt! Thanks so much for a wonderful time & great food. Nancy was so glad she came. You may have felt frantic at 3pm but by 5pm you were masters of the evening. The evening was really relaxing. We feel blessed to have you as neighbors.